Purim at Chabad Lubavitch of Playa Del Carmen is a happy and festive time where we celebrate the salvation of the Jewish people in ancient Persia. Please join us at our main event and megillah reading Thursday March 5th 4:30pm. On the theme "Purim in China" come dressed up and enjoy chinese decorations and food. You can find more information about the holiday below, We also listed the 4 important Mitzvot [comandment] of Purim with their explainations, 1) the Megila 2) The Purim feast party 3) "Matanot Levionim" Give to the needy 4) "Mishloach Manot" Send Food Portions to Friends, also a Holiday E-Guide with information and an interactive Purim website. 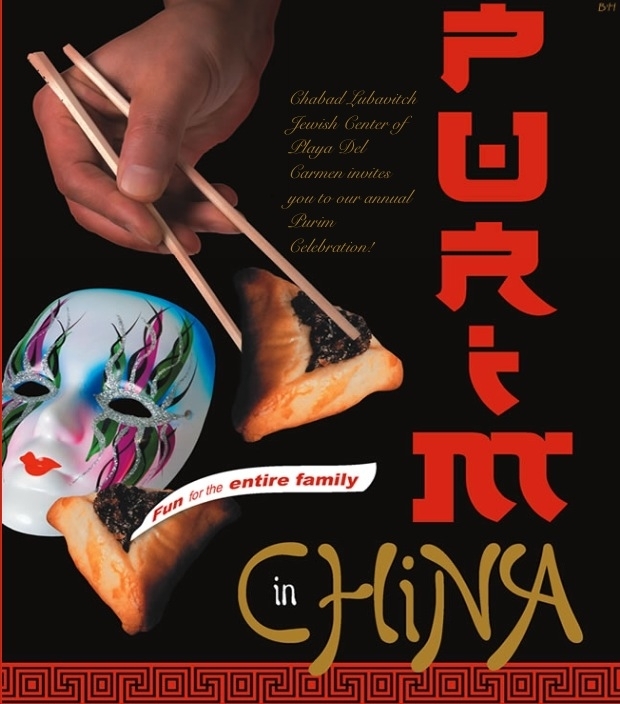 Purim Party "PURIM IN CHINA"
Delicious themed dinner *In House Sushi Chef * Salad bar * Hamantashen & Graggers * Music & dancing * Craft for Kids * Prize for every costume * Megilla reading * Fun for the whole family! To relive the miraculous events of Purim, listen to the reading of the megillah (the Scroll of Esther) twice: once on Purim eve, Wednesday night, March 4, and again on Purim day, March 5. Give charity to at least two (but preferably more) needy individuals on Purim day, March 5. On Purim day, March 5, send a gift of at least two kinds of ready-to-eat foods (e.g., pastry, fruit, beverage) to at least one friend. Men should send to men, and women to women. It is preferable that the gifts be delivered via a third party. Children, in addition to sending their own gifts of food to their friends, make enthusiastic messengers.